When I was in college, Salman Rushdie came and spoke in the school’s auditorium. The English department had reserved tickets for its students. Of course, I eagerly scooped two up. At the time, I had read part of The Satanic Verses, thought the prose was lovely and the story interesting, and like most literary folk, am vehemently against censorship of speech and writing, as well as issuing fatwas. So, back to our story. I was sitting in the audience, prepared to hear words of wisdom or in the very least, a gripping tale of how he lived part of his life in hiding from radical Muslims. Instead of choosing to speak on this or perhaps, even on craft or technique like other writers do at lectures, he pretty much turned in to an annoying, bloated old man. Rushdie did not say it directly (at least I can’t recall), but his lecture could be summed up with the following statement: Men are better writers than women. Ulysses; to which I bind myself like a martyr to a stake, and have thank God, now finished– My martyrdom is over. I hope to sell it for £4.10. A second comment that stood out was a terrible criticism about Jane Austen. He declared that unlike her male peers, Austen’s novels were frivolous and just soldiers dancing with ladies at parties. That’s sort of like saying, The Satanic Verses is just about a plane crash. Now, I know I’m being critical about someone else being critical and could be labelled a hypocrite but Rushdie was criticizing these canonical writers for their gender instead of proffering specific examples in their respective works to structure his critique. You might be asking yourself, why I am writing about my beef with the Rushanator? To explain this, I will have to divulge a guilty pleasure–Gawker. Sometimes, I just have to turn my brain off and one way that I do this is to read ridiculous articles on Gawker. Today, I came across this. 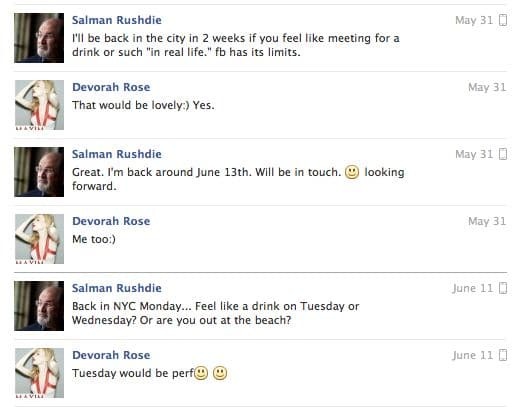 Apparently, Rushdie had some sort of relationship with a person I’ve never heard of but might be pseudo-famous(?) He said some unflattering comments about her that were printed in a newspaper, so she released their Facebook correspondences. 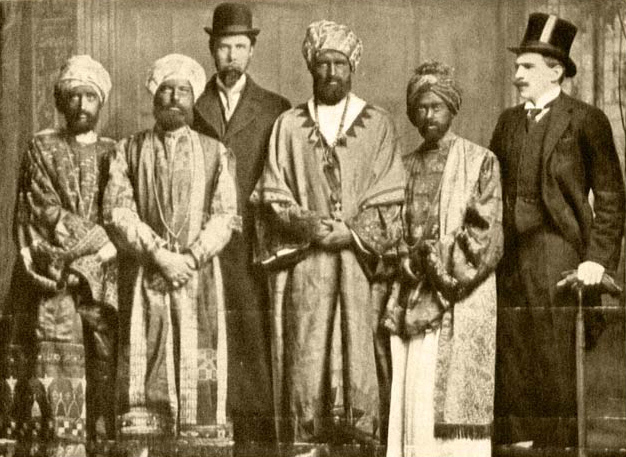 I was going to put a screenshot of Rushdie's Facebook message exchange but I thought I would take the high road and post this photo of Woolf in "Abyssinian regalia"; she is the bearded figure on the far left. I had no idea. It’s funny you should mention him today. As I was looking for the text of “The Distance from the Moon,” I came across an npr interview with him discussing Calvino’s Cosmicomics, and was thinking about him this morning. I remember really enjoying Satanic Verses and many other books of his. 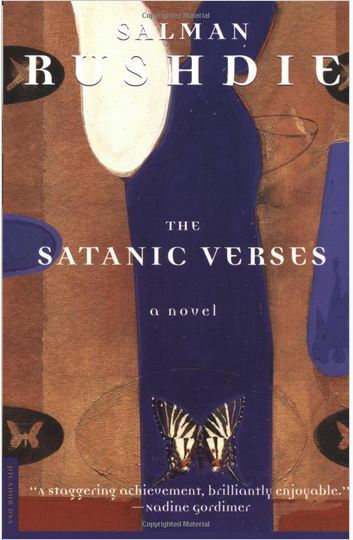 I greatly enjoyed Satanic Verses, too, krismerino – it’s actually one of my Top 10 favs. Maybe Mr Rushdie was having a bad day when you saw him speak at your university, AFP? I worked for an indie bookstore for many years where we hosted lots of reading/signing events with Salman Rushdie. He was ever the gentleman with staff and fans alike. Although it was tough — his dislike for the works of Jane Austen was as well known to us bookstore folk as James Ellroy’s love for a good drink (or 10!) — I forgave Salman his obviously faulty thinking in regards to this. I definitely divorce the Salman Rushdie that lectured from the Salman Rushdie of literary importance. I freely admit that I’ve never been much of a fan of Virginia Woolf’s books but I would never rip on her for her gender like he did (but perhaps, he has mellowed in the years since I saw him in college). I have ‘The Satanic Verses” on my bookshelf, and I intend to read it objectively. Still, I appreciate your candor. I think it is our gut instincts and our raw interpretations of people that are most valuable. Of course, Rushdie can’t be distilled down to your idea of him in one evening. Still, it is helpful to see the humanity in the genius. Thanks! I hope you enjoy the book; it’s beautifully written. Actually, this post makes me want to take a second look at it because it’s been a handful of years. It was just a really strange lecture and that’s how I will chalk it up in my memory. Hey there. It does seem a bit strange that Rushdie would directly attack Woolfe, and the double X chromosome, but it’s not totally out of the ordinary for important writers to hold odd views. This reminds me of the tenuous friendship of Fitzgerald and Hemingway. It’s great to read their correspondences, especially when Fitzgerald asked Hemingway to read over the manuscript for the Great Gatsby. The terrible thing about authors is they have to be people, and sometimes people are terrible. Still, it gives biographers something to get their teeth into. I know. In hindsight, I wish I hadn’t gone to his talk. I would have liked to preserve my glowing opinion of him. I recently heard that some scholars hold the belief that Roald Dahl was a racist/anti-semite. He was a childhood favorite and I hope this is just a rumor. Ignorance can be bliss sometimes.